The year of 2015 saw a lot of movies being theatrically released. During its 12-month spanned, feature films debuted weekly, ranging from a variety of genres from superhero blockbusters (Avengers: Age of Ultron and Ant-Man), big-budgeted films (Star Wars: The Force Awakens and Jurassic World), raunchy comedies (Ted 2 and Trainwreck), teen dystopian (The Maze Runner: The Scorch Trials and The Hunger Games: Mockingjay Part 2), page-to-screen (Fifty Shades of Grey and The Martian), and box office flops (The Fantastic Four and Pixels). In amidst of all these films (and then some), a low-budget sci-fi film titled Ex Machina was released and was considered a “hidden gem” or “sleeper” hit of that year. Directed by Alex Garland (who made his directorial debut) and starred Domnhall Gleeson, Alicia Vikander, and Oscar Isaac, Ex Machina followed the story of a computer programmer (Caleb) who is invited by his CEO (Nathan) to an isolated research facility to administer a “Turing test” to an intelligent humanoid robot named Ava. While the film didn’t have a robust box office success, Ex Machina did receive high praise from critics and moviegoers, praising Garland’s direction (for the movie), it’s sophisticated narrative importance on artificial intelligences, and the film’s small yet incredible cast. The movie also garnished several nominations and awards during the award season, including winning an Academy Award for Best Visual Effects. 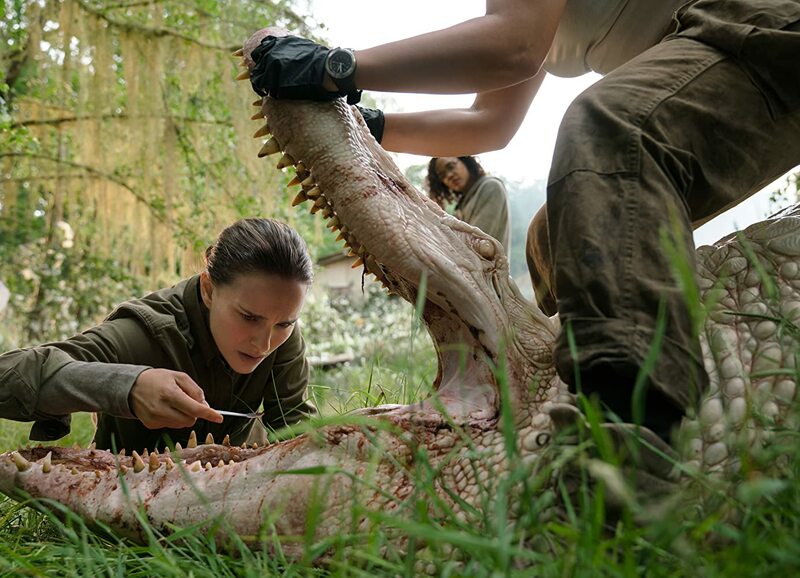 Now, several years since Ex Machina was released, Paramount Pictures (with Skydance Media and DNA films) and director Alex Garland present his newest film Annihilation, which is based on the book by Jeff VanderMeer. Does this ambitious sci-fi tale surpass Ex Machina or is it an ambiguous slippery slope for Garland’s sophomore endeavor? 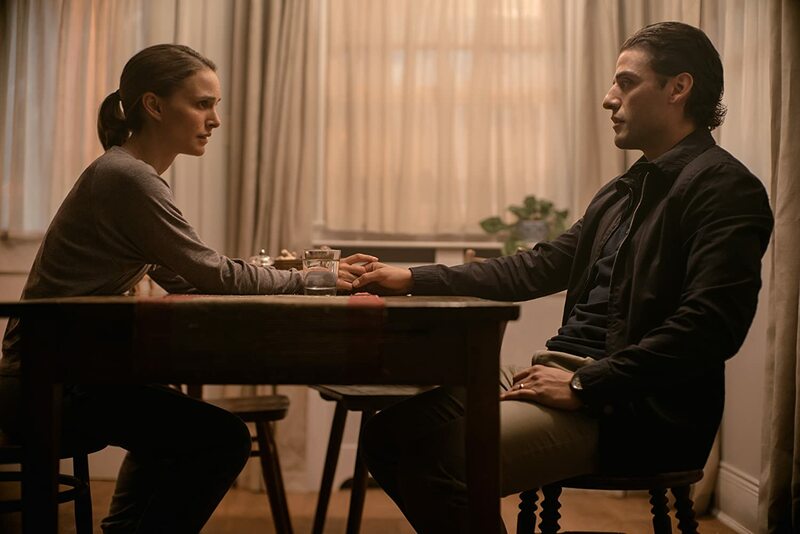 Army veteran turned academic biologist professor at Johns Hopkins School of Medicine, Lena (Natalie Portman) is still mourning the loss of her soldier husband, Kane (Oscar Isaac), who was presumed KIA during one of his covert missions. When Kane suddenly returns home, Lena is overjoyed, but soon finds out that he isn’t the same man who left one year prior. Soon after his return, Kane becomes gravelly ill (slipping into coma) as Lena and him are whisked away to Area X, a secretive base of operation for the Southern Reach organization. Headed by Dr. Ventress (Jennifer Jason Leigh), this organization has been investigating “The Shimmer”, an unnatural and distorted growing field phenomenon that started at a lighthouse and has been expanding for the past three years. Very little is known about The Shimmer as various attempts have been made to retrieving information inside this explainable distortion, but none have returned…. until Kane, whose team was recently sent into The Shimmer and was the only survivor to come back. Fearing what’s inside and its continuous growth, which could potentially lead to a global pandemic, Lena, endeavoring to save her husband, joins Dr. Ventress into venture into The Shimmer, along with Anya Thorensen (Gina Rodriguez), Josie Radek (Tessa Thompson), and Cass Sheppard (Tuva Novotny). Once beyond its liquid rainbow veil, the expedition unit is exposed to an evolution of sorts, realizing that The Shimmer is mutating / altering the cell structure of any living thing it reaches. Unfortunately, the unit soon discovers that the deeper they venture into The Shimmer (in an attempt to reach the lighthouse) the more dangerous it becomes, building to a surreal and profound answer. Ex Machina…. how much I love that movie. Of all the movies I remember seeing during 2015, the particular film caught me by surprise. Yes, it wasn’t my personal favorite one (Mad Max: Fury Road won that title), but this sci-fi tale was definitely something that wasn’t on my “movie radar” that year and completely took me by surprise, placing it as #3 on my Top 10 Best Movies of 2015. I really didn’t hear much about this movie during its pre-release months. Heck, I didn’t even know of Alex Garland and his previous work on 28 Days Later, Sunshine, Never Let Me Go, or Dredd. It literally wasn’t until a week before its nationwide release that I began to hear some positive buzz about Ex Machina. After doing some digging into the film (i.e. seeing the cast and viewing one of the movie’s trailers online), I decided to see it (in theaters) and absolutely loved it. I was totally engrossed in the movie and loved the cast (Vikander was excellent as Ava) and the whole narrative’s “highbrow” stance on artificial intelligence was entertaining and poignant. Plus, I did like the film’s twist at the end of the movie…. really didn’t see that coming. In the end, Ex Machina really does show how a feature film, despite it being low-budget (roughly made for $15 million) and with a limited cast, can really outshine some of Hollywood biggest budgeted / star-studded films. Like many out there who loved Ex Machina, I was definitely curious to see what director Alex Garland would direct next and when will that be. This, of course, leads me to my review for Annihilation, Garland sophomore and newest film. When it was announced, I was definitely intrigued to see what Garland was going to come up, especially since was going to direct the film and do the film’s screenplay (much like he with Ex Machina). As little tidbit information about the movie got released, the film’s two trailers really made me want to see the movie and was looking forward to seeing this movie in theaters during its opening weekend, which I did. So, what did I think of it? Was it better than Ex Machina? Well, I still think Ex Machina is a better film. That being said, Annihilation is still a stunning and eerie film that, while a bit complexed and bizarre, provides enough substance for another successful hit for Garland. As an interesting point, the road to getting Annihilation released is quite unorthodox. While after the critical success of Ex Machina, a deal between Paramount Pictures and Netflix (the film’s distributor) was made on Garland’s newest project. The deal stipulated that the film would be released on Netflix’s streaming service in most international countries, while the film will still have a theatrical release in the United States, Canada, and China. Yeah, as I said…very unorthodox. The one reason behind this was after Skydance Productions head and Annihilation David Ellison voiced concerns that Garland’s movie was “too intellectual” and “too complicated” as well as saying that Portman’s character (Lena) was too unlikeable. However, David Rudin (the film’s executive producer) defended Garland’s overall vision and (theoretically) had final say over the final cut to Annihilation. To be fair, Annihilation is clearly a high-concept (i.e. highbrow) sci-film that offers a lot of creative and intellectually experience. However, much like Ex Machina, that’s really Garland’s specialty and it works within the context of Annihilation in both in tone and storytelling. 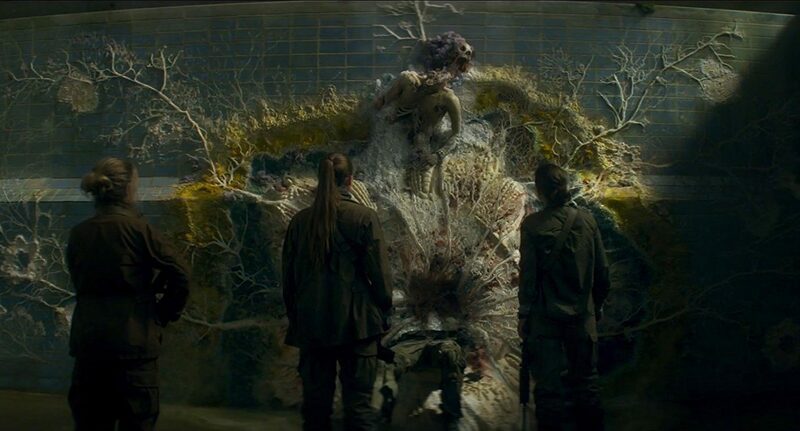 Also, before I forget to mention (and as I stated above), Annihilation is based off of the first book (presumable because they both have the same name) of author Jeff VanderMeer’s “The Southern Reach Trilogy”. While I had intended to read the book, I ultimately didn’t get a chance to do so. Thus, I really can’t compare “apples to apples” when comparing the book to film aspect of Annihilation on what was add, subtracted, or changed. Like Ex Machina, Alex Garland plays double duty as Annihilation’s director and screenplay writer. Given VanderMeer’s novel narrative (story and plot), Garland draws upon the dreamy / surreal qualities to make Annihilation feel every sci-fi-ish and intriguing. Additionally, Garland’s work behind the camera allows for the film to be beautiful and brutal within its various set-pieces come to life. There’s definitely a serenely beautiful quality to the movie when Lena and the rest of the team enter the Shimmer, with all the evolved / mutated floral and fauna grow rapidly as well as interesting idea of the entire landscape being unnaturally altered by the distortion enigma. Thus, Rob Hardy (the film’s cinematographer) must be commended for heightened view such interesting and visually stunning shots as well as the entire visual effects team and production design team. Interestingly, there’s a blending of beauty and nightmare when it comes to Annihilation as the film slides between hauntingly beautiful to horror elements. To his credit, Garland’s overall directorial work helps the movie shift between these two aspects as well as answering some poignant means. Like Ex Machina and few other highbrow sci-fi films (i.e. Arrival and A.I. ), Annihilation offers plenty sci-fi question in pondering its “big ideas” of one’s self within the greater context of scientific meaning. Again, Garland does so beautifully, pondering questions like what it means to be human as well as who we really are inside and the notion of what’s artificial vs. what is human, illusions vs. reality, and the ultimate scary idea of things ending (death and destruction) vs. the wondrous beginning of something new (birth and creation). All of those fundamental and theatrical questions are indeed meaningful and something that could be debated amongst peers and society and Annihilation does so in a way that cinematically good and opens the door to discus (or at least ponder) such sophisticated questions. Also, the film’s third act, which can be a bit bizarre to some, offers an interesting look into Garland’s tactics as a film’s director as much of the scenes, especially the climatic point, is mostly a visual on-screen driven than dialogue driven, which is very daring and also cinematically driven, with very little talking points being displayed between characters at this particular point. Additionally, during these sequences (as well as the overall film), composers Geoff Barrow and Ben Salisbury provides a very verbose and eerie score to Annihilation, which does provide heightened context within the movie. There are a few drawbacks that hold Annihilation from reaching cinematic greatness or even overtaking Garland’s Ex Machina. For starters, much like what I said earlier, the movie’s ideas and sophisticated concepts might be a little off-putting to some, which was why the decision to release the film on Netflix (internationally) was made. The film’s third act is the big moment when could “make or break” a viewer’s overall likeability as the story takes a turn into the more “bizarre” realm. Suffice to say, that Annihilation isn’t as easily “accessible” as Ex Machina was, with a lot of elements either that unexplained and / or too weird. Personally, there are some stuff in the movie that I felt was really bizarre and eerie, but, given the film’s narrative context, it worked and didn’t bother me. Still, the whole bear scene in the movie “freaked me out” as well as one particular scene when team discovers camera footage of a guy being cut open (totally squirmed in the seat when I saw that). Another problem is that how the film is presented, with the character of Lena being somewhat questioned and telling the story (via flashback). While this tactic is not uncommon to be used in various storytelling (i.e. books, TV, and film), it sort of takes away from about what ultimately becomes of certain individuals as us (the viewers) already know of who lives and who dies in the story being told, which takes a bit away from the overall allure of the film. Additionally, the movie is a slow-burner endeavor, which might be off-putting for some out there, especially if they were expecting more something along the lines of a sci-fi action flick rather than a sophisticated sci-fi drama / horror feature. Personally, it didn’t bother me as I was expecting such a film from Garland. Also, the film’s script, while indeed palpable and commendable on Garland’s part, is a bit underserved within character development of several characters, but more on that below. 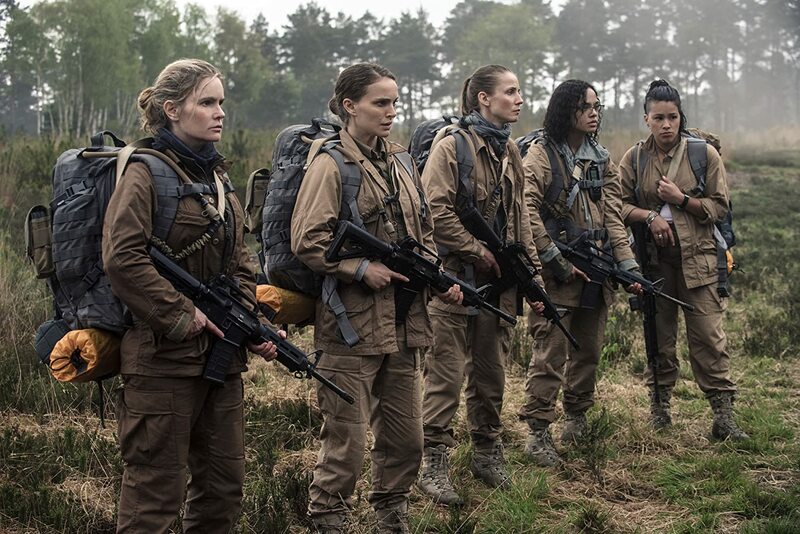 While Garland made a statement by only having three primary characters (actors) in Ex Machina, so he does again by having an all-female actress in Annihilation lead roles. Naturally, actress Natalie Portman acts as the main star of the film with her character of Lena being the focal point of Annihilation’s story. Portman, known for her roles in Black Swan, Jackie, and V for Vendetta, delivers a complex performance as the scientist who is fascinated by the Shimmer (seeking answers) and a grieving woman emotionally driven to save her husband. Much like the film states, Portman’s character is not perfect, though her character is all more fascinating for her depth and how she acts (and reacts) to exploring this distorted / surreal landscape with its mutated elements and unexplainable phenomenon. In short, it may not be her best performance in her career, but Portman’s Lena is still a solid one for what Annihilation’s narrative needs. Behind her, in terms of screen-time, would have to be actress Jennifer Jason Leigh as the enigmatic Dr. Ventress. Known for her roles in The Hateful Eight, Dolores Claiborne, and Anomalisa, Leigh performances in the film is a good, though perhaps much of the character’s depth is explained through exposition rather than letting the actress show us. This, of course, isn’t much on Leigh’s performance of Dr. Ventress, but rather on Garland’s overall direction for this particular character. Still, Leigh’s Ventress has that mystery and haunted persona, which (like Portman’s Lena) is what the film’s story needs. The other three leads in the movie, which consist of actress Gina Rodriguez (Deepwater Horizon and Jane the Virgin) as paramedic Anya Thorensen, actress Tessa Thompson (Creed and Thor: Ragnarok) as physicists Josie Radek, and actress Tuva Novotny (Eat Pray Love and Dag) as geologist / surveyor Cass Sheppard, give strong performances in their respective roles. However, much like what stated above, these three are underserved by the film’s script and are, more or less, served to function as the stereotypical cannon fodder in the context of an adventurous exploration team (think of all the team members with an Aliens movie). Still, their performances in Annihilation are good and makes them compelling in the right. Rounding out the cast (in more supporting roles) are actor Oscar Isaac (Ex Machina and Star Wars: The Last Jedi) as Lena’s husband Kane, actor David Gyasi (Cloud Atlas and Interstellar) as one of Lena’s academic colleagues Daniel, and actor Benedict Wong (Doctor Strange and The Martian) as Lomax, the individual who questions Lena on the vitally of her story on what happened. While these characters are mostly side characters and don’t necessarily outshine the five main leads, their performances are still very much solid. Lena seeks answers and joins explorative team that investigates an unnatural distortion and face unimaginable horrors and revelations in the movie Annihilation. Director Alex Garland’s newest film, which is based off of VanderMeer’s first book in a trilogy, takes another stab at highbrow science fiction and presents a very surreal and unique film that poses some very poignant questions. While it can outshine Garland’s Ex Machina and not as easily accessible to everyone (as well as film other minor problems), the film still intriguing and highly intellectual within its concepts and visuals as well as providing some great performances within in its actors / actresses and Garland’s overall handling of the feature. Personally, I liked this movie. It was definitely bizarre (at certain points), but the film’s progression kept me intrigued and engross in the film from start to finish. Thus, I would give Annihilation my “recommended” stamp of approval as well as an “iffy-choice” just because can be semi-confusing and / or off-putting for some moviegoers. It will be interesting to see what international viewers think of this movie when it debuts on Netflix soon. In the end, Annihilation stands as Garland’s solid follow-up to Ex Machina, providing a visual stunning and thought-provoking sci-fi feature film. Can’t wait to see what Garland will do for his third film. It’s definitely bizarre, and there are plenty of loose ends to wonder about on the way home, but I like that in a movie. Haha…right you are. It’s one of those movies that makes you think. I agree, it’s very intellectual, which may be off-putting. I’m still thinking about it. So I totally agree with you tacking on the “iffy-choice” tag here, as it’s not for everyone. For those seeking joyous entertainment, I didn’t count a single smile the entire film, did u? I’m still not convinced Garland didn’t somehow Houdini his way out of some major problems with this movie. I don’t know what they are though or how he did it haha. I agree with you, the interrogation detracted from the story. Especially since all Lena ever responded was “I don’t know.” And Jennifer Jason Leigh’s character was not well developed. Overall, I’m giving it my stamp of approval as well though. It’s a good think piece. Haha….you’re right. Portman’ character kept on saying “I don’t know” quite a lot. The film is still very good and definitely poignant, but not for everyone, especially those who don’t like slow burners. The interrogation took away from the suspense of who lives/who dies, but her answers of “I don’t know” were puzzling at first and added to the need to discover the shimmer along with the characters, and the “I don’t know” tied off nicely when the audience finally saw the nature of the entity and ourselves experienced why she couldn’t explain it. I felt the “I don’t know” fit nicely into the overall concept. Also, That bear scene freaked me out too! I’m sure there will be a sequel. Oooh, there is a chance that this movie will turn out like the Maze Runner then! Oh yeah, that ending sequence was a bit bizarre indeed. Strange, but ambitious. And I need more of that. Nice review. Haha..yeah. It was definitely strange (at times), but still a good highbrow sci-fi film. Definitely agree with you on that. I would welcome that with more movies like this. Nice review but I’ll have to take the low road and say overall I didn’t care for this movie beyond liking Natalie Portman’s character, who hit a good good balance between soldier and scientists. She’s not usually one of my favorites, but she pulled this off quite well. The ending I know was opened ended deliberately, and I can deal with that. But the characters, a group of misfits, why were they even chosen? Why didn’t they examine what was going around them more? Why were they all so shallow and unlikable? Questions kept popping up for me but it wasn’t because I didn’t get the intellectual desire they were trying to achieve. My questions were just complaining that it didn’t make any sense in the context of the movie. It’s hard to explain without posting spoilers, which I don’t like to do. I’ll just say for me the scifi failed. The character connection failed (I feel more attached to the Fast and Furious crew). And the effects, especially at the end, failed. The good points I’ll say about this movie are 1) They did a good job making the “world” seem realistic, and 2) Natalie Portman hasn’t been that cool since The Professional. Sort of agree with you. I knew that it was going to be hard and a bit highbrow sci-fi with a lot of odd and “thinking” material. So it didn’t bother me as much. Yeah, it was definitely a bizarre movie, but still very intriguing and engaging, especially coming from Garland.